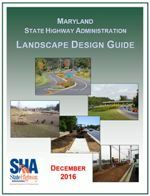 MDOT SHA Landscape Design Guide (PDF, 2.99 MB) describes Maryland Department of Transportation State Highway Administration (MDOT SHA) policies and design principles for landscape construction, including standards for landscape plans, mitigation design, offset distances and related topics. 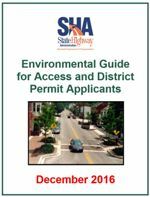 MDOT SHA Environmental Guide for Access & District Permit Applicants (PDF, 455 kb) explains key principles and provides required MDOT SHA Landscape Notes for plans developed for Access and District permits. MDOT SHA Landscape Estimating Manual (PDF, 1.30 mb) includes information required to develop plans and specifications using the 2017 Standard Specifications for Construction and Materials. MDOT SHA Preferred Plant List (PDF, 1.07mb) is a spreadsheet of plant materials that are appropriate for MDOT SHA roadways. The structure of the Preferred Plant List is explained in the Landscape Design Guide. MDOT SHA Landscape Specifications This page links to MDOT SHA Standard Specifications. 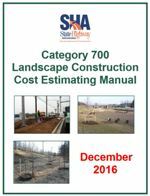 The Standard Specifications for Construction and Materials Wiki summarizes all current specifications required for landscape construction under District, Access and Utility permits.